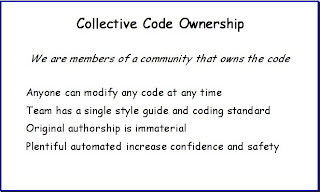 See Extreme Programming's writeup on the rule of collective ownership. Next to pairing, the Agile practice that causes consternation among developers is the idea of collective code ownership. It is not a difficult concept to grasp, but individual ownership is a difficult idea to let go. Developers inclined or acclimated to working solo find this four-bullet card quite threatening, and the motto above it positively chilling. But what if we were truly working as a community? We would give up having the final say about how our code is formatted and how variables were named. We might find other people's pet peeves getting equal say. We might find that other people can take over the code we wrote. We might be able to be sick for a day or go on vacation without work ("that only we can do") piling up. We might be able to simplify the team's work by having a single work queue. We might find that we can help make other people's code better. We might find that they can improve ours. But we have to get over the idea that the code is ours. It's not ours. It really belongs to the customer or company the second it rolls off our fingers. It won't follow us home, and we can't take it with us when we leave. It is copyrighted by the company as a work for hire. Let's not lose sight of that nugget of reality. Anyone can modify any code at any time so that nobody has to seek permission to simplify and speed the code, or to add features that might touch code they don't own. Tests can be written because code can be made testable. This frees the development team from fear of a certain variety of personal conflict getting in the way of getting real work tested and delivered. The team has a single style guide and coding standardnot because some arrogant so-and-so pushed it down their throat, but rather the team adopts a single style so that they can freely work on any part of the system. They don't have to obey personal standards when visiting "another person's" code (silly idea, that). They don't have to keep more than one group of editor settings. They don't have to argue over K&R bracing or ANSI, they don't have to worry about whether they need a prefix or suffix wart. They can just work. When silly issues are out of the way, more important ones take their place. Original authorship is immaterial because "it's my code" has never been a valid reason to avoid improving or modifying a system that doesn't work or which doesn't do enough. In agile teams, we try not to talk about the original author when we are working on code. It simply is. It had an original intent, and we hope to strengthen it and make it more clear. The code exists and works. We want it to work better. This focus on the behavior of the code over the personality of the author is freeing as well. We can learn together once we let the guards down. Plentiful automated tests increase confidence and safety so that we can learn while coding. If code is test-driven, every violation of the original intent (as expressed in the tests) is met with a test failure. Rather than pre-worrying every possible code change, the developer pair can make progress in short order and can refactor without fear. This is better for the company, better for the programming pair, better for the individual. Reading over this card, I wonder if we missed the more important point that work does not have to queue for individuals. Too often we find work piled up for one or two siloed developers while two more are nearly idle because their silos are not busy. This is inevitable when our team structure involves multiple queues, and it is a shame. If we broke down the silos and followed pairing, testing, and collective ownership practices for just a little while we would find ourselves in a situation where any number of developers would be able to pick up the jobs that are waiting. Scenario 1: Fred can produce automated filing reports in a day. Abe and Margaret together could get it done in two and a half days.. It makes sense to have Fred do this work, yes? But it's Wednesday, the work is due Friday, and Fred has 16 hours of more important work that is also queued for him. Now it seems foolish to assign Fred, because it will cause us to miss a release or else Fred will work copious overtime while Abe and Margaret go to the bar at 3:30pm. A good deal for Abe and Margaret, bad for Fred and risky for the company. Scenario 3: Abe and Margaret already have worked with Fred in the automated filing area many times over the past three months, and feel pretty comfortable there. There are a lot of tests, and these tests help them to avoid checking mistakes into the code line. Fred has three days of work to be done, and a new two-day assignment was added to the pile. Margaret feels pretty comfortable with the new work, and should be done in two days. Fred and Abe team up on the remaining work, and at the end of the slightly-longer-than-usual day they're half-done. They should be able to finish up tomorrow. Fred's had bad Thai food. He begs off and dashes home. Charlie comes in to pair with Abe and Margaret as needed so that the release can finish on time. This is an argument not only that a team should pair and explore the project's code, but also that they should be doing so at all times. The team should always be able to cover for members who are incovenienced by family emergencies or personal illness. It is dehumanizing and will reduce good programmers to undifferentiated ”cogs”. It has been our experience that it improves the human side of the operation, and that great programmers are not great programmers because they keep a walled garden of code working, but because they are good at programming. Why hide greatness under a bucket? Why limit a great programmer to a small corner of a system if you want the system to be great? Wouldn't a great programmer be better recognized by peers if they get to share in his great work? It doesn't work in the face of refactoring and renaming code. You would think, yet somehow it still does. Common code and frequent integration make this largely a non-issue. And if people must work in the same small area of code, they can locate closer together and talk over their changes on-the-fly to make integration easier yet. It will be hard to get any design done. A team does settle into shared design with surprisingly little thrash. The idea that good design is the work of a single enlightened individual and that it cannot be understood or appreciated by his peers is largely unsupported. An incremental project does small acts of design all of the time, and often hold impromptu stand-up meetings to talk over changes that impact the system on a larger scale. You can't really get people to do it. However unlikely it seems, many work precisely this way each day. More surprisingly, people come to truly love the flexibility and expanded influence that collective code ownership gives them. This is particularly true in agile shops where they practice pair programming and unit testing. *Rhetorical question. You always choose the child. Of course, you may still face dire consequences at the job. Personally, I would hate to be the manager who has to tell clients that he can't make the release date because he only has one programmer competent to do the work. Who should really be in trouble here? Odd--it does on my browser. It didn't until anony told me, and I fixed it immediately thereafter. I forgot to mention that I'd fixed it. Well, darn, are mine OK? I always thought both yours and mine worked from day one. I noted another slight problem--the float:left css directive causes some wrap issues. I've simply been taking it off of the html for the image. Oops. Metaconversation in here. Lets continue in email, and let the readers chime in here. Well this is a good discussion point. I was aware of the metaconversation aspect here, and thus inviting readers to also pitch in with their suggestions. But I suppose it's also clutter that could detract from content-oriented discussions. Actually, the metaconversation is an indirect example of a single style guide and coding standard. If a standard exists (in this case a contractual behavior for this blog), it should be followed. I 'made' the change, and Tim did the work for me. Thanks Tim for not 'owning the code', and adhering to the standards. You saw it here first. I'm reversing my position. Any comment that improves the blog, the book that it may become, the deck of cards, or the authors (in order of increasing importance) is most welcome. The word "tests" is missing from the last line of the card image.